Plans to install smart meters in millions of British homes will be reviewed by the government spending watchdog, the BBC has learned. The National Audit Office says it will investigate whether the planned £11bn rollout will save customers money. The Department for Business, Energy and Industrial Strategy says it will work with the NAO to "help review the progress of this important programme". 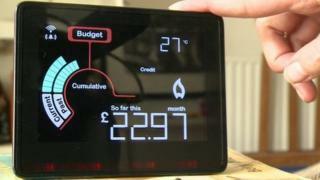 Smart meters show how much energy is being used and the cost in real time. The technology is projected to save £16.7bn through reduced energy use, with the cost of the scheme funded through energy bills. Meter readings are sent back to the supplier, with the promise of energy bills based on accurate use, rather than estimates. But some users have experienced problems with installations, inaccurate bills or loss of the meter's 'smart' features when they switch suppliers. Now the National Audit Office says it will review the project. Its study will "assess the current economic case for the rollout of smart meters and look at whether the government is on track to achieve its target to roll out meters by 2020". The deadline for the government's plan to install 53 million smart meters by 2020 has been questioned by MPs, with 8.6 million fitted so far. The IT system that allows meters to communicate with suppliers, the Data Communications Company (DCC), has not launched yet, despite being due to go live in 2015. The industry body responsible for promoting smart meters, Smart Energy GB, defends the pace of the rollout. Its chief executive Sacha Deshmukh told BBC Radio 4's You and Yours programme that 8 out of 10 people with smart meters were "very happy with the meters and would recommend them to their friends and family". The Department for Business, Energy and Industrial Strategy has also defended the plans. A spokesperson said: "Smart meters are a vital upgrade to bring our energy infrastructure into the 21st Century." The National Audit Office is expected to publish its report in summer 2018.